A little more than a month ago, Amazon rolled out 14 TV show pilots for its Amazon Prime members to vote on, with the winners getting the chance to grow into real series. Wednesday, the company announced the fan favorites, comprised of two adult comedies and three kid shows. 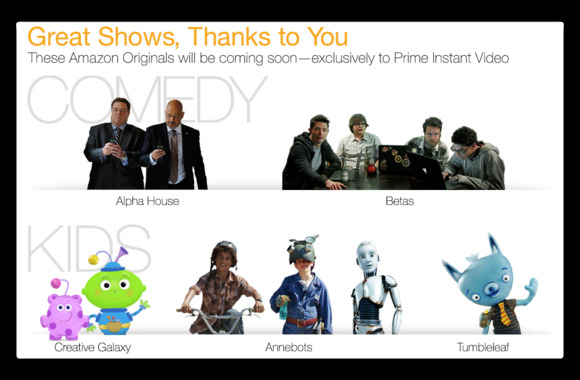 Amazon expects to begin rolling out episodes of the new shows later this year and early in 2014. To watch you’ll need to subscribe to Amazon’s $79-a-year Prime service, which offers free two-day shipping on many items, free Kindle ebooks, as well as unlimited streaming of Prime Instant Video movies and TV shows. Alpha House, which our TV columnist cited as “certainly the most professional-looking pilot in Amazon’s lineup,” was created by Doonesberry cartoonist Garry Trudeau, and is about a house shared by four Republican senators led by John Goodman. Betas, a show about friends running a start-up working on a mobile social networking app, purportedly stars Ed Begley Jr. as a Silicon Valley VC, but looks to focus more on the unknowns playing the start-up team. As for the kid shows, all three are animated. Annebots is a science-based show about a girl with robot helpers who performs scientific experiments in the back of her dad’s junkyard. Creative Galaxy focuses on creative thinking through crafts, story, music, and dance (and comes from the creator of Blue’s Clues and Super Why!, two of my kids’ favorite shows). Finally, Tumbleaf revolves around an odd-looking blue fox named Fig and is targeted at preschoolers. Amazon is following in the footsteps of Netflix, with its original programs that include House of Cards, Hemlock Grove, and the return of Arrested Developement, with plans to add more in 2014. Hulu also also producing a number of original and exclusive series.